You can add a border around cells to distinguish specific values, outline summarized values, or separate data into ranges of cells. To quickly add an outside border, simply select the cells that you want to include and press Ctrl+Shift+7 on your keyboard. On the Home tab, click the arrow next to the Borders icon, and from the dropdown menu, choose the border option that you want to apply. Tip: The Borders button shows the most recently used border style. To apply the same style, click the Borders button (not the arrow). 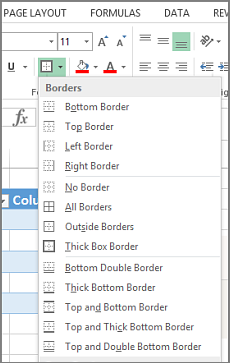 To remove all borders: Select the cells from which you want to remove borders, and then choose No Border from the menu. Draw cell borders using different line styles and colors. Create a border cell style to quickly apply a frequently used border style.